180 Degree Turn Time29.03 sec. ARP Takao — Japanese Tier VIII cruiser. The Tsundere Heavy Cruiser of the "Fleet of Fog". Modeled after Takao, the lead ship of the Imperial Japanese Navy's Takao-class cruisers. She loses a duel against I-401 while patrolling the Kumano Sea area. After her defeat, she decides to leave the "Fleet of Fog" to join the "Blue Steel" led by Gunzō Chihaya. Takao’s Mental Model has a great deal of curiosity, which led her to unwittingly collect a lot of information about humanity. 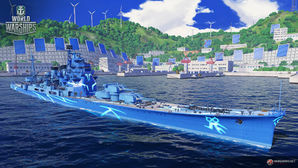 This warship has been specially designed for World of Warships, and is modeled after Takao as she appears in "ARPEGGIO OF BLUE STEEL -ARS NOVA-". ARP Takao is identical to Atago. Bearing the same ABC-XY turret layout of her historical predecessor Myoko, this heavy cruiser is fairly similar to her predecessor, but improves on many traits such as turret traverse and overall handling. While her main battery rate of fire is slower, her torpedoes are quadruple tube mounts (for a total of 16 instead of 12) and the forward launcher on each side fires forwards instead of backwards, making it useful against enemies in front of the ship. She also gains access to the Repair Party consumable, allowing her to recover HP, unlike most other cruisers at Tier VIII). Her impressively low detection range means that she can engage the enemy at her terms, and if situations go awry she can sneak away (providing there are no aircraft patrolling the sky or a nearby destroyer to detect her. With a full concealment build she can even fire torpedoes from beyond her detection radius in certain situations. She does have a few drawbacks, with a very large citadel hitbox — due to the large bridge/boiler area amidships — as well as a slow rate of fire and a mediocre anti-aircraft suite, but she is overall a very powerful ship. Most of the pros of Atago: good handling characteristics, has access to the Repair Party consumable, much wider torpedo launch arcs than regular tech tree Japanese cruisers, low detection range. Does not take up standard port slots. Comes with free Commander Skill points (varies by region). Skills can be customized for her, as captain is personalized for this ship. Unique announcer can be used as the default announcer for other ships. Most of the cons of Atago: citadel is fairly easy to punch through, torpedo tubes are likely to be hit and disabled by enemy fire, slow-ish turret traverse, low rate of fire, very mediocre AA suite. Commander cannot be transferred to ships of other nations. Does not earn extra credits like other premium ships. Does not come with overwhelming firepower, speed, submergence, Klein field, or super graviton cannons of ARP Takao in Ars Nova. As a premium ship, ARP Takao doesn't have any upgrades to research. Slot 5: Concealment System Modification 1 ( ) gets her detection down further allowing better stealth. The importance of ARP Takao’s access to the Repair Party consumable cannot be overstated; it is highly recommended that captains spend the credits or doubloons on the premium version for the additional charge (and shorter cooldown). Given her extreme vulnerability to enemy aircraft, Defensive AA Fire is recommended instead of Hydroacaoustic Search. ARP Takao cannot mount camouflage due to her unique skin. ARP Takao is — like Atago — far and away the fastest Tier VIII cruiser in the game; a Sierra Mike flag is recommended for captains who are interested in maximizing that speed. Zulu Hotel, Victor Lima, and India X-Ray flags are also recommended. Zulu Hotel will add additional commander experience, and Victor Lima and India X-Ray add an additional 2% to the fire chance of her main battery high explosive shells. Takao was originally a heavy cruiser of the First Oriental Fleet within the Fleet of Fog. After Gunzō defeats her in battle, Takao falls in love with him and later joins the Blue Steel fleet. She realizes what a human captain can do. If a human captain can increase the capabilities of a submarine, think of the new abilities of a heavy cruiser! Takao therefore seeks to add Gunzō as her captain to increase her abilities. In the manga, she is almost destroyed for good by Zordan's fleet but is saved in the nick of time by a surprise attack from Iona and Hyūga. However, her core is salvaged by I-402 and delivered to Yamato, who assigns her to infiltrate a human facility in a special mission with the promise of being allowed to return to Gunzō's side once it is accomplished. The spin-off manga Salty Road follows Takao’s days among other humans during said mission. In the Ars Nova anime adaptation, Takao sacrifices her vessel self to save Gunzō and the critically damaged I-401. This results in a super submarine called the Ars Nova with the processing capabilities of both Takao and Iona. At the end of the anime she regains her Mental Model form. In the Cadenza movie, she regains her ship after negotiating as a messenger to the Japanese government of the vibration warheads' codes with the help of Hyūga’s skills and enters combat to save I-401 from the Fog's student council and buys time in order for I-401 to defeat Musashi. Takao (高雄?) was the lead vessel in the Takao-class heavy cruisers, active in World War II with the Imperial Japanese Navy. These were the largest and most modern cruisers in the Japanese fleet, and were intended to form the backbone of a multipurpose long-range strike force. Her sister ships were Atago, Maya and Chōkai. Japanese cruiser Takao in 1930. Takao on trials in 1932. Digital colored photograph of the Takao. US Office of Naval Intelligence recognition drawing of the Takao-class. The quad 610-mm torpedo tubes on the Takao, 21 December 1939. Takao (center) heads towards Guadalcanal on 14 November 1942 followed by the battleship Kirishima (far background) to bombard Henderson Field. The photograph was taken from cruiser Atago. This page was last modified on 29 June 2018, at 13:49. This page has been accessed 54,046 times.